What happens when you pair multiple Grammy® Award-winning singer/songwriters from two separate groups whose members are also part of a legendary gospel dynasty? The new super trio, 3 Winans Brothers. With 17 Grammys among them, a star on the Hollywood Walk of Fame, countless accolades and more, 3 Winans Brothers, Bebe, Marvin and Carvin, have joined together for the first time ever because of their love for writing, singing, and performing music. Their debut album, Foreign Land (released September 30th, 2014) was written by the brothers, and released on the siblings’ independent record label, Regimen Records through a partnership with BMG & eOne Music. Now, Louie Vega has taken one of their album tracks, the song “Dance” (which features the Grammy Winning Clark Sisters) and reworked it for the dance floors. This version also included on Vega’s new upcoming album this summer “Louie Vega Starring…” will be released as a single on April 21, 2015 at all Digital Outlets on Vega Records. And look out for the vinyl release too. After a stellar performance at Miami Music Week at the Poolside Funkified Get Down Jam in March 2015, 3 Winans Brothers Featuring The Clark Sisters have a smash hit already at clubs through select DJs playing it, on radio with regular rotation in the tristate area on 107.5 WBLS in NYC, MAGIC 95.9 FM in Baltimore and now Washington DC’s WHUR 96.3 FM. 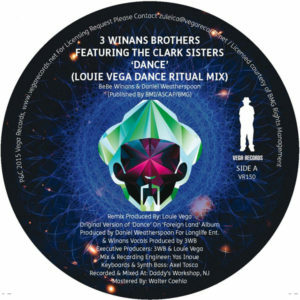 The Royal Families of Gospel are taking the world by storm with “Dance” (Louie Vega Mixes) - 3 WINANS BROTHERS FEATURING THE CLARK SISTERS, Universal Sounds riding the musical dance waves worldwide! !